Come join our VIP Reception, too! With gourmet appetizers, desserts, wine, beer, a signature drink, fabulous people, and great seats for the show, you are guaranteed a good time. VIP reception tickets, which include admission to the Gayla, are available in A price seating; just follow the link above! A hysterical and heartwarming celebration for everyone 10-90 years old. 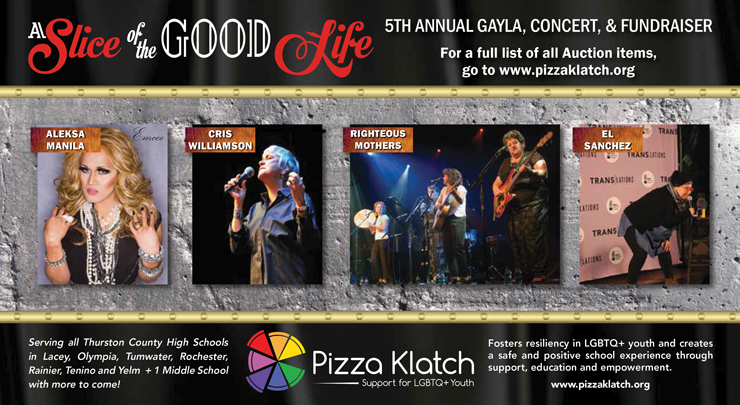 Pizza Klatch’s 2019 Annual Concert and Online Auction includes the iconic American feminist singer-songwriter Cris Williamson, the hysterical and social justice focused Righteous Mothers, storyteller and comedian El Sanchez, “they make magic out of any moment”, and our emcee, youth drug counselor by day and Diva by night: the fabulous Aleska Manila. Pizza Klatch saves lives and keeps youth in school by providing lunchtime support groups for LGBTQ+ youth and allies in Thurston County high schools and middle schools.